WordFly is an advertisement-supported program that is officially promoted at wordflyapp.com. This suspicious application is meant to make web searching much more enjoyable and simple, but most users do not feel much enjoyment while using this intrusive piece of software. 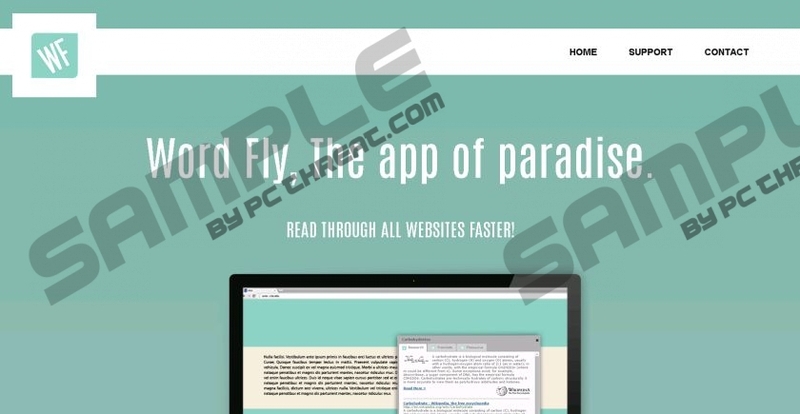 If you do not remove WordFly from your operating system, you will keep encountering pop-ups and commercial advertisements whenever you browse the web, and our researchers do not identify them as reliable. Most users install WordFly thinking that it will allow them to highlight any word on any website to find easy access links to Wikipedia and Bing web pages providing more information. In this sense, this adware is identical to another ad-supported program, Swift Search. Both of these programs require removal, because neither of them can be trusted. This report focuses on the removal of WordFly, but it is likely that you can apply the same removal tips to delete Swift Search or similar ad-supported programs. Even though WordFly does not look like a dangerous program, it can open up backdoors to third-party websites, and this is considered to be dangerous. Of course, the links to Wikipedia and Bing are unlikely to cause any troubles, but you have to be careful about the ads and pop-ups linking to unfamiliar websites. In the worst case scenario, these links might expose you to malware installers, and this might result in you having to delete many other threats. Remember that deleting WordFly itself can already be difficult. The presentation of suspicious links is not the only feature that you need to be aware of. You also need to be familiar with the cookies that WordFly installs to record information about you and your browsing behavior. Even though these cookies are unlikely to collect sensitive information, it is possible that the data collected by them could be shared with unreliable parties. Needless to say, if you delete WordFly-related web cookies, the irritating ads will not stop showing up, but it is important nonetheless. WordFly has a working uninstaller, and we represent the manual removal of this threat via the guide below. Of course, you should not take on the manual removal if you do not know how to remove WordFly-related unreliable programs. This ad-supported program can travel packaged with unfamiliar programs, some of which might have to be deleted. Luckily, automatic malware detection and removal software can delete WordFly and all other threats while protecting your operating system at the same time. Click Start on the Taskbar to open the user menu. Choose the program you wish to get rid of and click Remove. Navigate to the Taskbar and click the Windows icon on the left. Launch RUN (Win+R), type in Control Panel, and click OK.
Quick & tested solution for WordFly removal.